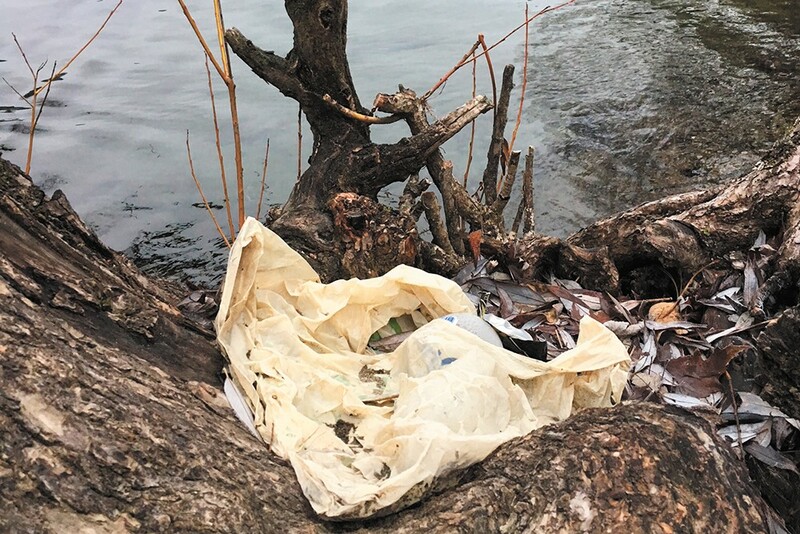 As Democratic lawmakers and activists look to deliver big wins for the environment during the upcoming 2019 legislative session, one major push will be to pass a statewide ban on single-use plastic bags. "We have a growing load of plastic pollution that we're seeing in our rivers and lakes, as well as our oceans," explains Heather Trim, executive director for Zero Waste Washington, which works to combat climate change and pollution through legislation. "We see addressing plastic bags as a great solution." On top of littering land and water, the familiar thin "T-shirt"-shaped bags can also clog up recycling center equipment and city storm drains, Trim says, making them an easy target as people push to curtail plastic use. Lawmakers haven't yet prefiled bills detailing the bag ban, which proponents are also calling the "Reusable Bag Bill," but the basic outline is this: Grocery and retail stores would no longer be allowed to give out plastic bags or paper bags, except for the small plastic and paper bags used for produce, meat and things like prescriptions. Larger paper bags could be sold for 10 cents each, and stores would keep that fee to offset the costs. The fee is also the main incentive for consumers to bring their own reusable bags, though it wouldn't be charged to low-income people buying groceries with government assistance. The legislation is largely based on bans passed in nearly two dozen jurisdictions around the state, Trim says. People seem to have embraced those city rules pretty well, says Rep. Strom Peterson, D-Edmonds, who was on the Edmonds City Council when it became the first in the state to ban plastic bags in 2009. A statewide rule could create more consistency for business owners and help address other issues with plastic, which is why Peterson plans to sponsor the bill in the House. Sen. Kevin Ranker, D-Orcas Island, plans to introduce the Senate version. The legislative session starts Jan. 14. "As we've seen with now nearly two dozen municipalities around the state implementing this, 1) I think it's effective, 2) I think people have embraced it," Peterson says, "and probably most importantly, 3) we see the continuing buildup of plastics in our environment as well as the effect of these plastics on our recycling stream and waste stream, and the costs involved. This is a great opportunity for Washington state to step up and do the right thing." But not everyone is a fan. Critics point to the fact that thin plastic bags are much less energy intensive to create and transport, and are often reused as garbage can liners. To offset the potential climate impacts of, say, growing cotton and transporting the heavier material, cotton reusable bags need to be used about 50 to 175 times to equate with a plastic bag that's reused for garbage, according to Danish and British government studies released in 2018 and 2011 respectively. There's more to that picture though, Trim and Peterson argue, as the studies leave out other considerations such as the costs of pervasive plastic pollution in the environment and contamination for recyclers. In the Inland Northwest, plastic made up a huge portion of the 15,000 pounds of riverside litter that volunteers removed from the Spokane River this year, says Spokane Riverkeeper Jerry White. While that's certainly not all from plastic bags, it's routine, he says, to find the bags caught in willows, brush and along the shore. "Plastic is a massive emerging pollutant of concern," White says. "And it's no longer just really something we're worried about in our oceans, it's definitely a pollutant that we're seeing is present in our rivers and freshwater." While the extent of plastic pollution in freshwater fish is far less studied than in marine life, a 2017 study by Isaac Caruso, a Spokane high school student at the time, found microplastics in 66 percent of the 33 mountain whitefish he sampled from the Spokane River. Also, the most popular reusable bags, made from plastic fabric, are far less energy intensive than cotton, needing only about 15 uses to match a single-use bag. Trim says reusable bags can often replace more than one plastic bag and last years. "I have bags I've used for 30 years and I love," Trim says. "The bags hold a lot more groceries than little plastic bags that rip." Notably, grocery stores are largely embracing the bans. Kroger, which owns Fred Meyer and QFC, plans to phase out plastic bags at all of its stores by 2025, with Puget Sound stores up first. The company doesn't yet know when the bags will be eliminated in the Inland Northwest. The Northwest Grocery Association, which represents those stores and other large chains like Safeway, Albertson's and Costco, supports the bag ban, says spokesperson Holly Chisa. The Washington Food Industry Association, representing smaller grocery chains like Rosauers and Yoke's Fresh Markets, appears likely to support the legislation, as long as it also includes a consumer education campaign, says Jan Gee, the association's president and CEO. "Where we've had local bans previously, our clerks have had a lot of backlash," Gee says. "It's not their fault, they're just doing their job collecting the fee and informing the public the plastic bags are banned." The grocers also want customers to be aware of cross-contamination risks, Gee says, making sure they wash reusable bags regularly and mark which ones they use for meat and vegetables, keeping them seperate. "We're very concerned about the cleanliness of the reusable bags," Gee says. "Because the public, they're not as aware of food-safety issues as our grocers are." Another major concern is that reusable bags have sometimes increased shoplifting, Gee says, as people put things in their own bags and walk out without paying. The original print version of this article was headlined "Pushing out Plastic"